If you walk in American cities, you know the streets weren’t engineered for you. The obvious signs are the broken, obstructed, or just plain non-existent sidewalks. But there’s also a less visible bias against walking programmed into our traffic signals. At the Transportist, civil engineering professor David Levinson outlines how signal timing conventions favor driving over walking. Beg buttons assume that cars always matter but pedestrians don’t. “Green waves” speed motor vehicles without considering the movement of people on foot. The lack of time for pedestrians to cross streets may be harder to spot than the lack of good sidewalks, but it’s just as pervasive. Pedestrian time must be considered (and prioritised) in the traffic signal timing algorithms so that their weight is equal to or higher than the weight of a passenger car. Pedestrians should get the maximum feasible amount of green time on a phase, rather than the minimum, so that pedestrians arriving on the phase have a chance to take advantage of it, and slower moving pedestrians are not intimidated by cars. Pedestrians should get a ‘leading interval’ so they can step into the street on a ‘walk’ signal before cars start to move on a green light, increasing their visibility to drivers. Pedestrian phases should be automatic, even if no actuator is pushed. Instead, the actuator should make the pedestrian phase come sooner. Many more intersections should have an all-pedestrian phase (what is referred to as a ‘Barnes Dance’) in addition to existing phases so pedestrians can make diagonal intersection crossings without having to wait twice. Some American cities are putting these strategies into practice. 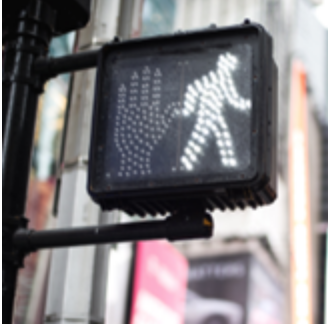 New York, for example, has accelerated implementation of leading pedestrian intervals, which is credited with reducing pedestrian fatalities there. Nationwide, however, the U.S. is moving in the wrong direction, with pedestrian deaths soaring. Traffic signals that prioritize pedestrians should be standard in every city, but they remain the exception, not the rule.